ok i will try to reistall it as administator and it worked the same way when i didnt have C&D as default. (...) it worked the same way when i didnt have C&D as default. So something was wrong immediately after installation. What are the settings in your MCDU's options? Did you reinstall before posting those four screenshots? The only other thing I can think of is that maybe there is an issue with the RAAS update. 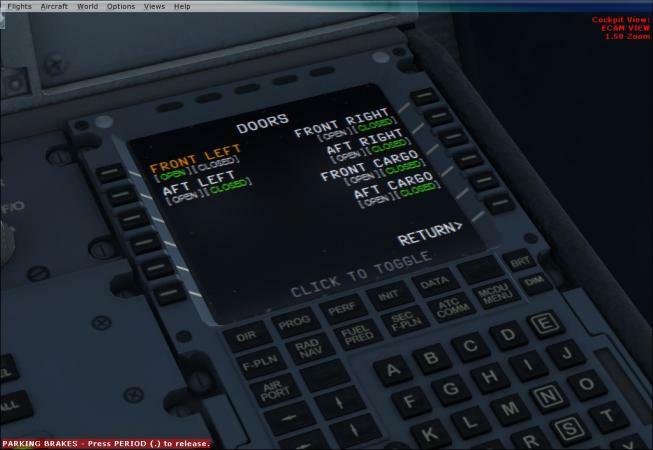 When you start FSX or Prepar3d, did you or do you still get a message saying update found for RAAS. Did you do the update. I have not updated it yet but I believe the RAAS update for the Airbus x extended is free..... as updates generally are. In the Right MCDU thread there are many posts dealing with the checklist not working....... perhaps you could have a look through those and see if there is a solution in one of those posts that may work for you. Otherwise one of the Aerosoft support guys will have to help you. By the way, you are not on Windows 8 are you? Maybe that is an issue . 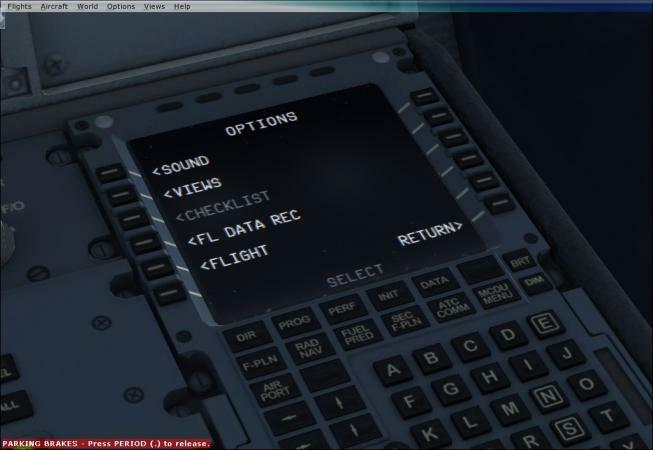 Under Options switch on the checklist functions for both Captain and FO. You can contact support directly at support@aerosoft.com . If the AXE is loaded already with an FSX ”Free Flight” sometimes there are problems that the aircraft state is not loaded properly even that it is set to DEF in the right MCDU. This has nothing to do with the AXE but with the FSX functionality. So there are two options to solve this problem. Do not load the AXE with the FSX Free Flight but just use another MS standard plane and after is has been loaded change to the AXE. Try to load “COLD DARK” again after the AXE has loaded (using LSK1L from the right MCDU – ACFT STATE Menu. establishing EXT PWR or doing anything else has nothing to do with the ACFT STATE. Again the CECKLIST becomes only available if an ACFT STATE is correctly loaded. [*]If this does not help then another possibility is that the ACFT STATE cannot be loaded because the files necessary are corrupted or not available. The 3 files for the DEF states we are talking about ar called Custom-13.abx and you can find those files in: C.\User\Your Name\Own Documents\Aerosoft\AerosoftAirbusExtended\ So please have a look into this folder and check if they are stored there. If you still have problems after checking those two things then I only can advise to reinstall 1.04. But please use the uninstall functionality and before installing 1.04 again please check that the following folders are completely empty respectively are not existing anymore. Check after doing so and then install HOTFIX 011 on top of it. The service seople will give you no other answer then this. I was able to re-create this issue where the checklist under options was disabled, as well as the options such as aircraft state and doors also being disabled. Hence not able to run checklist and not able to change aircraft state or open doors. Prepar3d started up and the airbus x extended went into cold and dark state as default....... top left corner of screen indicated door opening. 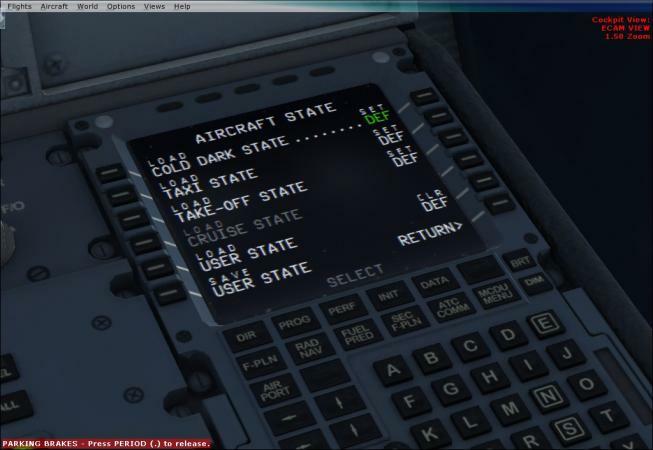 engines powering down and buttons and knobs were each going into their cold and dark status (off instead of on, etc) .While this was going on, I went into options 3 seconds after the default flight opened and changed the time, interrupting the go to cold and dark procedure. When the airbus was back, all screens were off. I started power, batteries, and when the mcdu was on, the checklist and a few other options were completely disabled. Hence I could not even start the checklist or change to another aircraft state. I believe this is because I interrupted the checklist while it was performing its thing and you should not change location or time once the checklist is going or while the aircraft status has not settled down. Then you do the startup of screens and you will see the checklist option is now enabled. If the above does not fix the checklist option, the default flight plan may be corrupted, Create a new flight plan and make sure the checklist has completed its thing before you save the flight plan as default flight plan. 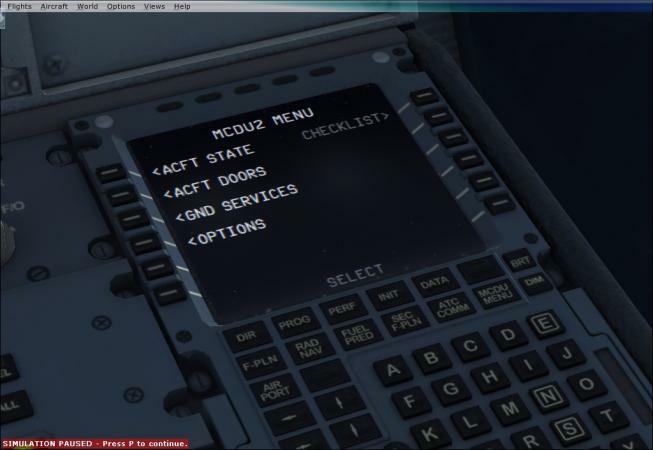 Important..... if the checklist is disabled in option menu.....reset your flight and let the startup state complete before going into options. this is great that your problem is solved now. Depending on the system it takes time to load a state (because there are so many items which have to be considered - app. more than 500). You can recognize if COLD/DARK is fully loaded on the UPPER ECAM the "engines" are amber/orange and at zero. Maybe what you should try (and on most systems this works fine) to set up a "free flight" with the AXE. Then you can make all settings before loading i. e. location, time etc. already and the AXE is loaded with the required situation.